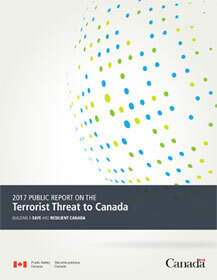 "This year's Public Report on the Terrorist Threat to Canada takes a clear-eyed view of the dangers to Canada posed by terrorism, and lays out how our professional security agencies use a full array of tools and powers to keep us safe and respect our rights. The evolving threat environment is diffuse and complex. While terrorist groups such as Daesh and al-Qaida continued to plan and execute elaborate attacks worldwide, lone actors or terror cells inspired by these groups are increasingly using low-sophistication, high-impact methods to carry out attacks. Recent events around the world remind us that any type of radical ideology can fuel terrorism, including right-wing extremism. Sadly, Canadians have become all too familiar with the tragic consequences – from the shooting at a mosque in Quebec City, which claimed six lives and injured many more, to the terrorist attack in Burkina Faso in which six Canadians were killed. Most recently, a police officer was stabbed and several bystanders were injured in Edmonton. The Canadian Security Intelligence Service, the Royal Canadian Mounted Police, the Canada Border Services Agency, and our other security, intelligence and law enforcement agencies work constantly to know as much as we possibly can about every threat to national security. All available data is steadily and expertly assessed and re-assessed to ensure that we are current and effective. Our security and intelligence agencies work 24/7 in close collaboration with our allies in NATO, the Five Eyes, the G7, the European Union, Interpol and others. This coordination is crucial in countering the global terrorist threat. I am encouraged by the strong, shared commitment among all our partners at the recent G7 Interior Ministers' meeting in Ischia, Italy, and the meeting of the Five Country Ministerial, hosted here in Canada. We have strengthened our ability to manage terrorist threats and events through the development of a Federal Terrorism Response Plan, which is outlined for the first time in this report. The government has also just launched the Canada Centre for Community Engagement and Prevention of Violence. It coordinates, bolsters, helps fund, and shares the various counter-radicalization programming that currently exists at the community level across the country. More broadly, we are modernizing and enhancing our security and intelligence laws through Bill C-59 (National Security Act, 2017). It provides our security agencies with the clear constitutional and legal framework they need to do their work effectively. The legislation was informed by the views of thousands of engaged Canadians, stakeholders and experts in a public consultation last year. That feedback pushed us to further strengthen accountability and transparency by proposing a new comprehensive expert review body for national security and intelligence across the entire government, and a new Intelligence Commissioner to review certain activities in advance—all in addition to Canada's new National Security and Intelligence Committee of Parliamentarians. The consultation also helped shape new Ministerial Directions to Public Safety's security and intelligence agencies on avoiding complicity in mistreatment by foreign entities. The Government of Canada is committed to protecting the safety and security of its citizens in this ever-evolving environment. This Report helps underscore the importance of staying vigilant and working together to ensure that Canada remains a fundamentally safe and peaceful nation." The main terrorist threat to Canada continues to stem from violent extremists inspired by terrorist groups, such as Daesh and al-Qaida. Daesh, and to a lesser extent, al-Qaida, continue to encourage followers abroad to employ simple attacks such as the use of knives or vehicles to inflict harm on the civilian population. Right-wing extremism is also a growing concern in Canada. The Government continues to monitor and respond to the threat of extremist travellers, who are individuals suspected of travelling abroad to engage in terrorist activity. Currently, there are just over 190 extremists with a nexus to Canada who are abroad and who are suspected of engaging in terrorist activity. In addition, the Government is aware of approximately 60 individuals who have returned to Canada. Since 2017, two individuals have been charged for having travelled abroad to engage in terrorist activities. We have witnessed an increase of low-sophistication, high-impact terrorist attacks around the world. In particular, we have seen the increased use of knives and vehicles in attacks, such as the attack that took place recently in Edmonton, in which five people were injured; and in New York, in which eight people were killed and several more seriously injured. Terrorists also intend to develop cyber attack and cyber exploitation capabilities, but to date, they have shown little ability to successfully launch high-impact operations. Extremist groups continue to use technology and social media as a means to recruit followers and promote their ideology. As the threat from terrorism continues to evolve, Canada's response must continually adapt and change to keep Canadians safe. The Government's role is to respond to a terrorist threat or incident through a coordinated effort by multiple federal departments and agencies, and all levels of government. The Government's national security response model is outlined in the Federal Terrorism Response Plan which sets out roles and responsibilities among the security and intelligence community. The Public Threat Report provides an overview of the Federal Terrorism Response Plan, including the multi-agency effort involved in the Government's response to terrorist threats. Canada is also contributing in a meaningful way, with more than 60 international allies, to the Global Coalition to Counter Daesh. Canada is assisting the Coalition's military and all civilian endeavors, including stemming the flow of extremist travellers, cutting off Daesh's funding sources, supporting stabilization, and countering Daesh's ideology. A key approach to countering radicalization to violence in Canada is establishing local programming within communities. In some cases, individuals who are in the process of radicalizing to violence can be redirected away from a path that could lead to terrorist activity. To coordinate the Government's prevention efforts, the Minister of Public Safety and Emergency Preparedness has established the Canada Centre for Community Engagement and Prevention of Violence. The Centre will engage with communities, support local-level programming through a Community Resilience Fund, and advance action-oriented research. Canada's security and intelligence community works together to help safeguard Canada and Canadians from a range of national security threats, including terrorism. This community consists of over a dozen departments and agencies that bring together a range of complimentary mandates and capabilities. While some of this community is focused exclusively on national security and intelligence issues, such as the Canadian Security Intelligence Service (CSIS) and the Communications Security Establishment (CSE), and others, such as the Canada Border Services Agency (CBSA), Global Affairs Canada (GAC) and Immigration, Refugees and Citizenship Canada (IRCC), have national security as only one part of a broader mandate, all parts must work together to safeguard Canada's security. Lastly, the Government carried out a series of consultations on issues related to national security, the results of which informed the development of Bill C-59, which was introduced on June 20, 2017. This Bill is aimed at ensuring that Canada's National Security Framework achieves two vital objectives simultaneously – keeping Canadians safe and safeguarding their rights and freedoms. Canada faces a continuing and evolving threat of terrorism. Terrorist acts are committed in whole or in part for political, religious or ideological reasons with the intention of intimidating the public, or a subset of the public. All forms of ideology have the potential to inspire individuals or groups to commit acts of violence in their name. In Canada, a small number of individuals continue to be radicalized and mobilized to violence, and may attempt to further their causes through violent means. Canada's National Terrorism Threat Level (NTTL) represents the likelihood of a violent act of terrorism occurring in Canada, based on information and intelligence. Canada's current terrorism threat level is Medium, meaning that a violent act of terrorism could occur, and has been at this level since October 2014. The principal terrorist threat to Canada continues to be that posed by violent extremists who are inspired by violent Islamist ideology, and terrorist groups such as Daesh and al-Qaida, to carry out an attack in Canada. Some individuals in Canada who are attracted and adhere to such ideologies engage in terrorism-related activities, including participation in online extremist forums, circulation of extremist propaganda, terrorist financing, travelling to join terrorist groups abroad, and in some cases, planning and carrying out attacks in Canada. The creation of al-Qaida in Iraq in 2004 eventually led to the foundation of Daesh in 2013. Its primary objective was to establish and maintain an Islamic State, or caliphate, based on a perverse interpretation of Islamic law. In 2014, Daesh leader Abu Bakr al-Baghdadi declared a so-called caliphate that initially encompassed a wide border between Syria and Iraq. It has since established provinces in parts of the Middle East, Africa, Asia and the Caucasus region. In 2017, Daesh struggled and lost ground within its core caliphate territory. In October 2017, U.S.-backed militias in Syria declared that they had retaken Daesh's capital, Raqqa. 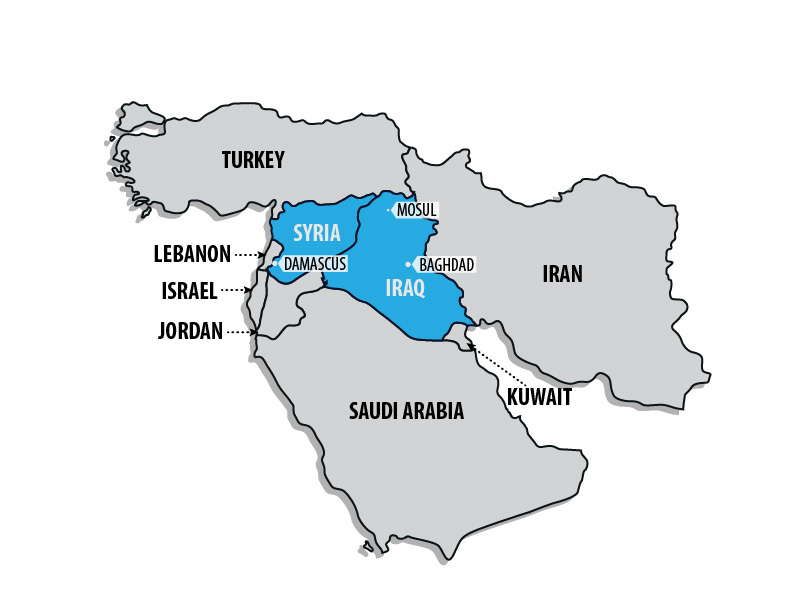 Despite these losses, the group continues to show resilience within Iraq, Syria and other parts of the Middle East. The extremist views and doctrines of the dominant terrorist entities around the globe gain incomparable reach via the internet. Violent extremists use the internet to produce and spread sophisticated online content to boast about battlefield victories, promote intolerance, justify attacks based on violent beliefs, and recruit individuals from around the globe. The internet makes terrorist propaganda widely available for public consumption in a manner that would otherwise be impossible and its spread is difficult to prevent. The use of social media and encrypted applications has emerged as significant tools for Daesh and other violent extremists to enable and inspire attacks in the West. While some social media companies have taken steps to shut down the social media accounts of terrorist groups and sympathizers, groups and individuals are quick to open new ones and continue the spread of terrorist ideology. For example, in 2016, the ‘Baqiya family', which is a loose global network of Daesh supporters, significantly expanded its online presence. Through online communication, the ‘Baqiya family' brainstorms attack methodologies, shares operational information, inspires attacks against the West, and builds a sense of community among extremists. For its part, al-Qaida has renewed its efforts to disseminate its Inspire magazine online. Thousands of individuals worldwide have been motivated to act in the name of the ideology they espouse by travelling abroad to support Daesh's cause and engage in terrorist activities. These individuals are referred to as extremist travellers. There are currently just over 190 extremists with a nexus to Canada who are abroad, including in Iraq and Syria. Just over 60 extremists have returned to Canada. Those numbers have remained relatively stable over the past two years, as it has become more difficult for extremists to successfully leave or return to Canada. In fact, the modest increase in numbers is due primarily to CSIS having identified further extremists who were already abroad. Slightly more than half of the extremists who are abroad are in Turkey, Syria or Iraq. Only a relatively small number of returnees are from that region but the majority of those who have returned from Turkey, Syria or Iraq are suspected to have been engaged in combat. Because of the relatively small number of returnees, the disclosure of more detailed information could identify specific operational interests. Our police forces and national security agencies continue to investigate extremists have travelled abroad as well as those who have returned to Canada. Canadians have been implicated in terrorism activities in several countries, including Syria, Iraq, and Algeria. While Canadian extremists have travelled in the past to support terror groups in many countries (e.g. Afghanistan, Somalia), Syria and Iraq currently maintain the highest concentration of Canadian extremists. Extremist travellers represent an enhanced threat given their training, experience and connections with terrorist entities. Compounding the risks presented by extremist travellers, Canada is also faced with threats from Canadians who, for a variety of reasons, cannot leave the country to join groups in conflict zones, and therefore could feel compelled to carry out a domestic attack. For example, Martin Couture-Rouleau and Michael Zehaf-Bibeau carried out attacks in Canada on October 20 and 22, 2014, respectively, after having been prevented from travelling to a conflict zone. Mr. Couture-Rouleau had his passport seized months before his attack, and Mr. Zehaf-Bibeau had difficulty obtaining a passport to travel prior to his attack. Extremism can stem from a range of ideologies. Recent events around the world have shone a spotlight on right-wing extremism. Right-wing extremism is driven by hatred and fear and comprises a complex range of individuals, groups and online communities espousing a number of issues and perceived grievances. In Canada, individuals who hold extreme right-wing views are predominantly active online, leveraging chat forums and online networks. Rather than openly promoting outright violence, those holding extreme right-wing views often attempt to create an online culture of fear, hatred and mistrust by exploiting real or imagined concerns when addressing an online audience. In doing so, they attempt to legitimize their beliefs and move from the fringes of society to the mainstream. The Canadian Charter of Rights and Freedoms guarantees the right to protest, as well as the rights of freedom of conscience and religion, expression, association and peaceful assembly. However, the evolution from online hate to serious acts of politically-motivated violence with the intention of intimidating the public, or a segment of the public in regard to its sense of security, could be considered a terrorism offence. The extreme right-wing is not an ideologically coherent group and historically, extreme right-wing violence in Canada has been sporadic and opportunistic. Nonetheless, the shooting at the Islamic Cultural Centre of Quebec City in Ste-Foy, Quebec, on January 29, 2017, in which six people were killed and 19 others injured, is a reminder that attacks perpetrated by those who espouse extreme right-wing views can occur in Canada. As there has been a rise in hate-related incidents reported to police in Canada, there is always the potential for extreme right-wing motivated violence to occur in the future. Terrorist groups are continually adapting in an effort to find new ways of committing attacks. As noted earlier, the internet, in particular, has enabled these groups to communicate with ease, which has increased their reach, abilities to spread propaganda and radicalize others, and their capability to plan and conduct attacks. Canada is not immune to this type of low-sophistication attack. As recently as September 30, 2017, a police officer in Edmonton, Alberta, was struck by a vehicle and stabbed multiple times by the driver. The assailant then fled on foot and later drove a U-Haul truck into multiple bystanders, injuring four people. When carrying out violent attacks, terrorists, especially those in the West, are increasingly adopting low-sophistication, low-resource means of committing high-impact violent acts. This is evident in the repeated use of vehicles and knives in terrorist attacks, particularly in Europe. These kinds of potential weapons are easy to obtain and it is therefore difficult to prevent their use in attacks. Daesh and al-Qaida propaganda has provided guidance to their supporters on the use of small arms, vehicles and bladed weapons, offering suggestions on how to inflict the most harm. Such encouragement to use simple weapons empowers those who would otherwise be incapable of conducting a more complex terrorist attack. Other, more sophisticated tactics, such as the use of bombs, Improvised Explosive Devices or automatic weapons, could be used in Canada. Such attacks are less common in Western countries (including Canada), primarily due to interventions of counter-terrorism agencies and law enforcement. Nonetheless, the capability exists, as demonstrated during the attacks in Paris in 2015, Brussels in 2016, and most recently, in Barcelona in 2017. Cyber attacks are efforts to damage or disrupt a computer system or electronic communications network, while cyber exploitation refers to obtaining information on a computer system or network that would otherwise be considered private. In February 2017, Daesh-linked hackers posted gruesome images of the Syrian war on numerous websites belonging to the United Kingdom's National Health Service. Cyber attacks and cyber exploitation are other means that terrorist groups use to carry out their objectives. Daesh and its affiliated cyber-actors have engaged in relatively unsophisticated cyber attacks against targets in both Canada and among our allies. For instance, Daesh-affiliated cyber-actors have claimed	responsibility for defacing both government and private-sector websites. The goal of these defacements is to showcase their cyber-capabilities, publicize Daesh propaganda, and issue threats to military personnel and elected officials. Terrorists have also engaged in distributed denial of service (DDoS) attacks, in which targeted systems are flooded with such a large volume of data requests that they can no longer function properly. In addition, Daesh has utilized rudimentary hacking techniques to acquire personal information. These acts of cyber exploitation have resulted in the publication of "kill lists" containing the names and personal information of apparently randomly selected individuals, along with calls for them to be attacked by Daesh supporters. Further, terrorist entities aspire to use cyber-tools as weapons that can cause physical harm to computer networks and systems, which would be a far more sophisticated type of cyber-attack. Possessing sufficiently advanced capabilities would enable them to successfully disrupt essential services and critical infrastructure (such as the electrical grid, water and food supplies, and transportation). Terrorist entities also rely on cyberspace to enhance the security of their conventional activities. Most notably, the increasing prevalence of encryption technologies allows terrorists to conceal their communications and evade detection by police and intelligence agencies. The ability to intercept terrorist communications is no longer always possible due to strong encryption. This is a significant challenge to the Government's ability to investigate and charge threat actors. This phenomenon is popularly described as "going dark". Although not a visible act, the financing of terrorism remains a significant concern within Canada. Small domestic cells and lone actors present a higher risk of committing violent terrorist acts on Canadian soil. In most cases, terrorist plots carried out by small cells and lone attackers cost less than $10,000, and the financial activity of those involved appears similar to routine financial behaviour, which makes them difficult to prevent in the absence of other threat-related information. As a result, collaboration with private sector entities providing financial services is important to help identify suspicious financial activity. Canada also faces risks from terrorist financing in the form of domestic support for foreign-based terrorist organizations such as Hizballah. This support means that funds are being raised in Canada and then moved out of the country to support terrorist entities in their home territory. In other cases, money raised abroad may be moved into or through Canada to advance ideological goals or take advantage of the stability and dependability of the Canadian financial system. Terrorism is a global phenomenon, yet Canada's geography protects us to a certain extent from the main source of conflict. Nevertheless, when terrorist threats or incidents occur abroad, their effects are immediately felt in Canada and have direct implications for Canadians and Canadian interests. As such, the Government works closely with allies in a joint effort to assess and respond to threats at home and abroad. On August 17, 2017, an attacker drove a van into pedestrians on La Rambla, a popular street in Barcelona. The attack resulted in the deaths of 16 people, including one Canadian, and at least 100 injured. Since the complex attacks in Paris and Brussels in 2015 and 2016 (involving simultaneous attacks by multiple individuals, including suicide bombs), terrorism in Europe has been typically characterized by increasingly low-resource, high-impact violent acts, and frequently inspired by extremists responding to Daesh's call for a ‘virtual caliphate'. This trend has been demonstrated by the repeated use of vehicles and knives in recent terrorist attacks. Daesh and al-Qaida propaganda has provided guidance to their supporters on the use of small arms, vehicles and bladed weapons. For example, Daesh has carried out attacks in France, Germany, Belgium, and the United Kingdom. Turkey has also experienced an increase in Daesh-linked attacks, including a shooting at a night club in Istanbul in January 2017. Several of these attacks were directed by Daesh facilitators online, while others involved direct participation of Daesh operatives who had received terrorist training in the Syrian conflict region. In 2016, Daesh lost significant territory in both Syria and Iraq, and suffered heavy casualties from coalition airstrikes. These casualties included the loss of its spokesman, Abu Mohammad al-Adnani, in late-August. In Iraq, a concerted campaign by elements of the Iraqi security forces, supported by Coalition forces, steadily pushed Daesh back from previously held territory. In July 2017, Iraqi forces proclaimed victory in retaking Mosul, Iraq's second largest city. In October 2017, U.S.-backed militias in Syria declared that they had retaken Daesh's capital, Raqqa. In Yemen, al-Qaida in the Arabian Peninsula (AQAP) and Daesh have both exploited the civil war. AQAP activities are directed against the Houthis, as well as the Yemeni government and security forces. AQAP also continues to emphasize attacking Western countries, and has claimed to have played a key role in the 2015 Charlie Hebdo attack in Paris. Daesh has carried out several high casualty attacks in Yemen against civilians, and Yemeni government forces. In Egypt, despite aggressive counter-terrorism measures throughout 2015 and 2016, Daesh's Sinai province continues to carry out attacks against the Egyptian state, Western interests and tourists, such as the attack on Russian charter plane Metro Jet 9268 in October 2015, and the attack in Hurghada in July 2017, which killed three tourists. Tunisia is also facing a significant terrorist threat from al-Qaida in the Islamic Maghreb (AQIM) and Daesh. Lone individuals inspired by Daesh and other terrorist groups also pose a serious threat to Westerners in Tunisia, as shown by the attacks on the Bardo museum in Tunis in March 2015 and in Sousse in June 2015. In East Africa, al-Shabaab remains the most prominent terrorist threat; in 2016, it was Africa's deadliest terrorist organization. On October 14, 2017, a large truck filled with explosives was detonated at a busy crossroads in the centre of Mogadishu, Somalia. This attack, which was attributed to al-Shabaab, resulted in the deaths of over 300 people, and hundreds more injured, making it the deadliest attack ever in Somalia's capital. Al-Shabaab maintains a core of trained, dedicated fighters in Somalia, and continues to carry out terrorist attacks against military and civilian targets. In Somalia and Kenya especially, al-Shabaab targets Westerners and their interests. In West Africa, AQIM and affiliated groups aggressively target Western interests. For example, AQIM conducted a series of attacks against popular tourist venues in Mali in 2015, Burkina Faso in 2016 and 2017 and Côte d'Ivoire in 2016, killing over 60 people, including eight Canadians. A faction of Boko Haram has been aligned with Daesh for two years, but since early September 2016, the faction has been known as Daesh-West Africa. Both factions carry out attacks and kidnappings in Northeastern Nigeria and neighbouring Cameroon, Chad and Niger. On September 21, 2015, two Canadians, along with a Filipino woman and a Norwegian man were abducted from a seaside resort in the Philippines by the Abu Sayyaf Group. On April 25, 2016, the first Canadian man was executed and the second was executed on June 13, 2016. The other two hostages were subsequently released. In 2016 Daesh established and strengthened links with existing extremist groups in the region. Through online activity, Daesh radicalized and inspired supporters across Asia to conduct attacks in Bangladesh, Indonesia and the Philippines, raising concerns about the growing terrorist threat in Southeast Asia. In the Philippines, Daesh conducted a siege of Marawi City in May 2017. In July 2016, a Canadian-Bangladeshi extremist named Tamim Chowdhuri perpetrated a Daesh-style, directed terrorist attack at a bakery in Dhaka, Bangladesh. He was killed by Bangladeshi security forces the next month. Additional attacks occurred in Russia, Kazakhstan and Kyrgyzstan, which demonstrated the widespread, global consequences of the prolonged conflict in Syria and Iraq and the terrorist threat emanating from that region. Al-Qaida increased its propaganda efforts across Asia in the past year, seeking to position the terrorist entity and affiliates as the long-term extremist alternative to Daesh. Al-Qaida in the Indian Subcontinent (AQIS), for example, conducted a campaign of violence in competition with Daesh in Bangladesh. Community: The Government is engaging directly with communities, providing resources and guidance to community members who may suspect that a friend, colleague or family member is being radicalized to violence. These efforts are coordinated by the Canada Centre for Community Engagement and Prevention of Violence. Recognizing that the terrorist threat continues to evolve, Canada's response must, in turn, adapt to keep Canadians safe, and must include prevention and intervention where possible. Canada also has a strong legal and policy framework to deal with this threat. Due to the global nature of the threat posed by terrorism, a collaborative international response is required to make meaningful progress in countering the threat both domestically and abroad. Canada works closely with its partners with respect to the exchange of timely intelligence and information sharing to effectively counter the terrorist threat, and to meet it head on. One of Canada's most important multilateral alliances for intelligence and information sharing is with the "Five Eyes" community, whose members are Australia, Canada, New Zealand, the United Kingdom and the United States. This partnership, which involves bodies focused on security, intelligence, cyber, migration, borders and law enforcement, works collaboratively to counter the spread of violent extremism and recruitment efforts by extremist groups. Canada's Ministers of Public Safety and Emergency Preparedness, Justice and Immigration, Refugees and Citizenship also meet with their Five Eye counterparts on an annual basis to discuss issues of common interests. At the most recent Five Country Ministerial Meeting, held in Ottawa on June 26, 2017, Ministers committed to, among other things, engaging with Communications Service Providers to address terrorist activities and propaganda online, as well as to examine the role of traditional and social media and community voices in facilitating or disrupting processes of radicalization to violence, and to support effective practices in this area. Canada's participation in these Five Eyes groups is a reflection of our commitment to integrating our approaches where a collective response is required. Canada also undertakes ongoing dialogue and consultations on counter-terrorism with allies around the globe, and is active in numerous international mechanisms to address the terrorist threat. These governance mechanisms include the United Nations (UN), the Global Counterterrorism Forum (GCTF), the Global Coalition against Daesh, the North Atlantic Treaty Organization (NATO), and the G7. The Counter-Terrorism Capacity Building Program (CTCBP) is another forum in which Canada participates and is a key part of Canada's international terrorism prevention efforts. Administered by GAC, and managed internationally, the CTCBP provides assistance to foreign states to enhance their ability to prevent and respond to terrorist activity in a manner consistent with Canadian values and international norms, standards and obligations. The Program fulfills its mandate by providing training, equipment, technical and legal assistance. Projects are currently underway in the Middle East, throughout Africa, and in Southeast Asia to work alongside allies to combat terrorism. Canada's response to the terrorist threat also contains a robust military response capability both at home and abroad. As noted in the recently released defence policy, Strong, Secure, Engaged, the Department of National Defence/Canadian Armed Forces (DND/CAF) is charged with actively addressing threats abroad for stability at home, developing awareness of its operating environment to better predict and respond to a crisis and addressing the threat stemming from terrorism and actions of terrorist groups in ungoverned spaces. The international community has organized its response to Daesh through the Global Coalition against Daesh, which is composed of 73 members (including the UN, the European Union, INTERPOL and NATO). Canada is an important member of the Coalition, participating in both its military and civilian lines of effort to cut off Daesh's access to financing, stem the flow of foreign fighters, counter its propaganda, and engage in security and stabilization efforts. In June 2017, Canada renewed the Canadian Armed Forces' military mandate to contribute to the Global Coalition until March 2019. The Government of Canada has at its disposal a variety of legal and operational tools to deal with potential or actual terrorist threats. Effective response to terrorist threats and acts requires strong investigative and prosecutorial capacities. CSIS is responsible for the identification, investigation and the provision of advice to the Government on threats to the national security of Canada. National security criminal investigations, including those related to terrorist activity, are conducted by the RCMP-led Integrated National Security Enforcement Teams (INSETs), which operate in the largest urban centres across the country. The INSETs are specialized, multi-agency investigative units which are co-located at the field level to enhance the Government's ability to investigate suspected terrorist activity and to respond to terrorism-related incidents. The National Security Joint Operations Centre (NSJOC) co-locates several federal departments and agencies, including the RCMP, CSIS, IRCC, and the CBSA, to enhance the Government's operational response to individuals seeking to travel abroad for terrorism purposes. This collaborative approach allows the Government of Canada to respond more effectively to the threat of high risk travellers, with all the available tools and capabilities. The NSJOC facilitates timely information sharing and provides support to national security criminal investigations led by the INSETs. However, there remain challenges when using national security-related information in court proceedings. The Government must balance the need to protect information and sources while providing enough information to ensure a fair trial, known as the "intelligence to evidence" dilemma. The Government also has a broad range of tools available that can be used to prevent criminal activity and to manage and disrupt the threat of terrorism. One of the tools in the Criminal Code is peace bonds. This measure allows the courts to place conditions on an individual where there are reasonable grounds to fear that the person may commit a terrorism offence. These conditions could include restricting movement and associations until the individual no longer presents a threat or criminal charges can be applied. CSIS also has a separate mandate to take measures to reduce the threat to the security of Canada. Another mechanism aimed at limiting the movement of individuals suspected of seeking to travel to engage in terrorist activity abroad is the Passenger Protect Program (PPP). The PPP works with air carriers to screen commercial passenger flights to, from, and within Canada, and uses specific, reasonable and necessary measures to address security threats. This program is administered by Public Safety Canada and Transport Canada, in cooperation with several other federal departments and agencies. The PPP allows the Minister of Public Safety and Emergency Preparedness to list an individual, and direct an air carrier to deny transportation to the individual or require them to undergo additional screening. In addition, the RCMP's Canadian Air Carrier Protective Program aims to protect the travelling public by providing armed officers on board selected Canadian-registered domestic and international passenger flights. The Government also has robust mechanisms in place to ensure that Canada's borders are safe. The CBSA maintains an active, ongoing posture to "push-out" the border in order to prevent terrorists from entering Canada, including through its National Targeting Centre, Liaison Officers posted abroad and security screening program. The Agency also protects Canada's national security by removing foreign nationals determined to be inadmissible to Canada on security grounds. Another tool at the Government's disposal is the listing of terrorist entities under the Criminal Code. The listing of an entity is a public means of identifying a group or individual as being associated with terrorism. While it is not a crime to be listed, a listed entity's assets can be frozen, seized or even forfeited. In addition, institutions such as banks, brokerages and insurance companies are subject to reporting requirements with respect to a listed entity's property and must not allow those entities to access the property. It is also a criminal offence to knowingly participate in or contribute to, directly or indirectly, any activity of a terrorist group, which includes listed terrorist entities. More than 50 terrorist entities are now listed under the Criminal Code. The Government's approach to counter-terrorism is complemented by a Cyber Security Strategy that sets out measures for securing government systems, partnering to secure vital cyber systems outside the federal government, and helping Canadians to be secure online. This multi-faceted approach to cyber security recognizes that digital technology plays a central role in the security, economic prosperity and everyday lives of Canadians. To keep pace with the evolving cyber threat, the Government of Canada has undertaken a review of measures to protect critical infrastructure and Canadians from cyber threats. Consultations were held from August to October 2016, and gathered feedback from Canadian citizens, experts, academics, business leaders, and all levels of governments. Information gathered from stakeholder consultations will inform the Government's policy and program decisions to improve overall cyber security. The Royal Canadian Mounted Police leads the criminal investigation into a domestic terrorist attack, as part of its mandate of primary responsibility for national security law enforcement in Canada. The Canadian Security Intelligence Service is responsible for leading the security investigation of a credible threat to Canada. The Communications Security Establishment is responsible for collecting foreign signals intelligence and providing support to federal law enforcement agencies in their legally authorized activities. The Canada Border Services Agency is responsible for ensuring the border integrity of Canada and supporting the RCMP and other agencies engaged in threat management and event response. The Department of National Defence and the Canadian Armed Forces are responsible for supporting law enforcement through the Request For Assistance process. If an incident is determined to be an attack against Canada, defence agreements may be invoked and the CAF would lead. Transport Canada is responsible for supporting the RCMP and/or DND/CAF in responding to a terrorist incident affecting the transportation system (all modes) and is also responsible to work with industry to implement appropriate transportation security measures. Health Canada is responsible for supporting law enforcement in responding to a terrorist incident involving Chemical, Biological, Radiological or Nuclear materials or a public health/consequence management response. The Public Health Agency of Canada is responsible for supporting law enforcement in responding to a terrorist incident involving biological material. The Plan recognizes that most emergencies are dealt with at the local level by local governments and first responders, including law enforcement. As the severity of the incident increases, the required level of response goes up. The federal government has lead jurisdiction for the management of terrorist incidents, and provincial/territorial, local governments and local law enforcement have essential responsibilities that require simultaneous and complementary action (such as emergency and security response, support for victims or consequence management). In complex situations, the Government Operations Centre, which is responsible for providing an all-hazards integrated federal emergency response to events of national interest, would provide strategic situational awareness and high level coordination for emergency management measures. identifies the communications framework for the Government of Canada to be used for a terrorist incident. Public Safety Canada's Community Resilience Fund (CRF) provides financial assistance to organizations undertaking programming and research to address radicalization to violence in Canada. The RCMP's long standing efforts to counter radicalization to violence encompass all violent ideologies. The First Responder Terrorism Awareness Program (FR-TAP) team develops and manages training for first responders and key partners to provide awareness about a range of criminal threats, including right-wing extremist groups. The training helps partners identify the early signs of radicalization and outlines possible responses. While the extreme right-wing has always been included in FR-TAP materials, a dedicated module is currently under development. Prevention materials have also been developed to inform stakeholders of the extreme right-wing. For instance, in June 2016, the RCMP released a Terrorism and Violent Extremism Awareness Guide to enhance awareness of radicalization to violence, with sections on extreme right-wing, far-left, single issues groups and religiously based terrorism (e.g. Daesh). Research will fill a knowledge gap by analyzing the operation and evaluating the performance of how multi-agency approaches to countering radicalization to violence work in Canada. The Calgary Police Service employs a multi-agency approach through its ReDirect intervention program to address concerns around radicalization to violence among young persons in Calgary. The Toronto Police Service, with support from Public Safety Canada and the RCMP, has enabled its FOCUS Rexdale Hub initiative to intervene with cases of violent ideology. Advanced research on perspectives of Western extremist travellers, their families and friends, and other online supporters of violent extremist movements. Research will help inform programs for rehabilitation, among others. One important component of Canada's approach to countering terrorism is efforts to prevent groups and individuals from radicalizing to the point of violence. In some cases, individuals who are in the process of radicalizing to violence can be redirected away from a path that, if continued, might lead to terrorist activity. The Government of Canada would rather see individuals prevented from radicalizing to violence than having to cope with the aftermath. To coordinate the Government's prevention efforts, the Minister of Public Safety and Emergency Preparedness established the Canada Centre for Community Engagement and Prevention of Violence (Canada Centre). The Canada Centre provides leadership on Canada's response to counter radicalization to violence by: advancing key policy priorities; engaging with communities; supporting local-level programming through the Community Resilence Fund; and, advancing action-oriented research. The Government is also working to address violent extremism online. Preventing extremists' use of the internet, however, is complex and involves competing priorities, such as safeguarding freedom of expression on one hand, while on the other denying hate, intolerance, and terrorist propaganda. The Canada Centre will work with Communications Service Providers and international partners to implement appropriate and effective measures to counter violent extremism on the internet. For example, the Canada Centre is committed to working with the Global Internet Forum to Counter Terrorism (GIFCT). Launched by Facebook, Microsoft, Twitter and Google, this forum is tackling terrorist content online. When an individual or group begins to adopt extremist beliefs centred on intolerance or hatred that promote violence, prevention needs to be more personalized. The Canada Centre supports these types of prevention efforts. Personalized interventions to redirect an individual away from a path that, if continued might lead to terrorist activity, often involve teamwork across multiple sectors, such as social and health services, law enforcement, education, and community-based organizations. These various bodies work in partnership to assess cases of individuals potentially at risk of radicalizing to violence, and design an intervention tailored to the person. The Canada Centre will continue to support the development and expansion of intervention initiatives in Montreal, Vancouver, Calgary, Edmonton, Ottawa and Toronto, and work with front-line workers who are involved in interventions, as well as policymakers and researchers to identify the needs and opportunities for effective multi-agency intervention programs in Canada. Notable examples of such collaboration between diverse partners are the Centre for the Prevention of Radicalization Leading to Violence, and SHERPA's Équipe clinique et formations en prévention de la radicalisation, both of which are located in Montreal. The RCMP's Federal Policing program has a dedicated Intervention Team which works in partnership with RCMP national security teams across Canada to determine if alternatives to criminal prosecution are feasible. The intervention team seeks to address both the ideology behind the radicalization to violence as well as other behaviours that are of concern, such as addictions and mental health issues. Other types of intervention can help to address the issue of Returning Extremist Travellers (RETs) and their families. RETs are a security concern for Canada due to skills, experience and relationships developed abroad that could be used to recruit or inspire individuals in Canada. When an individual returns to Canada after supporting a terrorist group abroad they may be charged and convicted of a terrorism offence and sentenced to prison. Some RETs, however, might be returning home with family members, such as children, who did not voluntarily choose to go abroad to support terrorism. The Canada Centre will work closely with federal, provincial, territorial and municipal partners to develop a coordinated approach to address such cases. RETs and their families who have been assessed as lower risk by security agencies will be encouraged to access relevant social services, which will not only help to lessen the security risk, but also reduce the resource burden on the security and intelligence community, so that it may focus on more immediate threats. In addition, through the Community Resilience Fund, the Canada Centre is supporting researchers, practitioners and law enforcement to manage RETs and their families while ensuring the safety of our communities. In September 2016, the Government launched a series of national security consultations to engage Canadians and subject-matter experts on issues related to national security and the protection of rights and freedoms. These consultations covered many issues, including countering radicalization to violence, oversight and accountability, threat reduction and the Anti-terrorism Act, 2015 (former Bill C-51). An overview of the findings of the national security consultations is available at: https://www.publicsafety.gc.ca/cnt/rsrcs/pblctns/2017-nsc-wwlr/index-en.aspx. Input from the consultations is being used by the Government to inform the development of laws, policies and programs to ensure that the National Security Framework is effective in keeping Canada safe, consistent with societal values and the Canadian Charter of Rights and Freedoms. strengthening security and protecting rights by proposing updates to keep pace with changing threats, the role of technology and an evolving legal landscape by modernizing the Canadian Security Intelligence Service Act, establishing the Communications Security Establishment Act, and making other legislative updates. The creation of a National Security and Intelligence Committee of Parliamentarians (NSICOP) is another important step the Government is taking to increase national security accountability and transparency. The Committee has a broad government-wide mandate to scrutinize national security matters, which will help to ensure both the protection of the public and the protection of the rights and freedoms of individual Canadians. The Committee will become operational within the next few months. Taken together, the Government's proposed measures represent extensive improvements to Canada's National Security Framework that will make Canada more secure, its agencies more accountable and its laws more precise and just. Although the focus of this Plan is on the domestic response to terrorist incidents, it should be noted that the Minister of Foreign Affairs leads the response to a terrorist attack abroad involving Canadians and Canadian interests. This mandate is in accordance with the Department of Foreign Affairs, Trade and Development Act and the Royal Prerogative over Canada's foreign affairs. Global Affairs Canada's framework for responding to international emergencies (including terrorist attacks abroad) is built around an Interdepartmental Task Force mechanism.